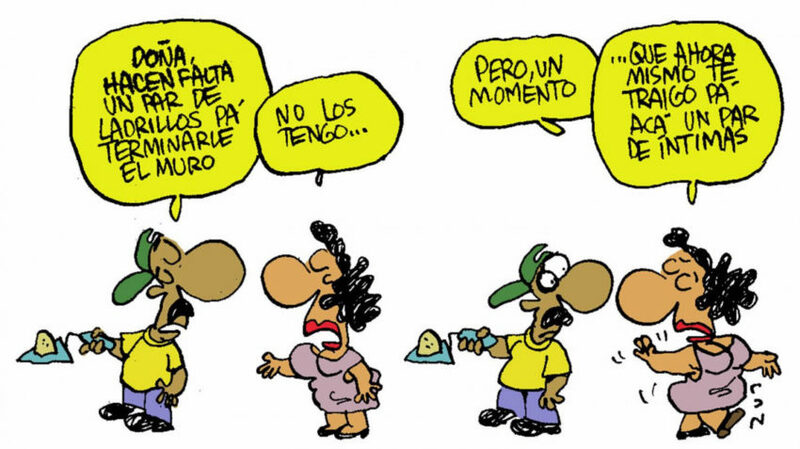 Renowned Cuban cartoonist. Director of the humorous publication DDT. 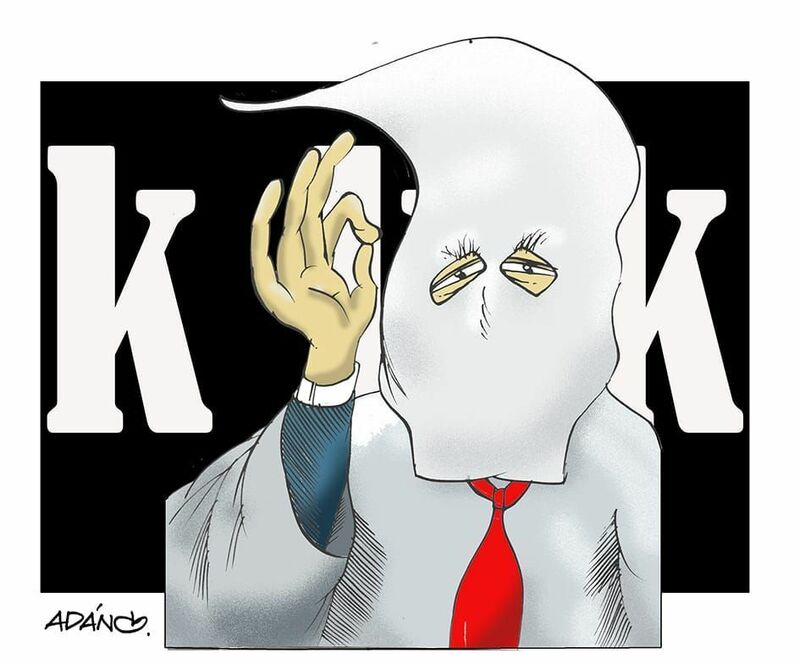 During the 2016 presidential campaign, Donald Trump was the candidate of several supremacist groups. Since his rise to power he has come to declare that among the supremacists there are “good people”. One package of sanitary pads is not enough to supply the basic hygienic need for women of childbearing age. Product quality is also an issue. All Cuban women of childbearing age are entitled to one package of sanitary pads per month 1.20 pesos in national currency. It may be that our country is the only one in the world that gives women the possibility of obtaining this product in pharmacies in a regulated manner, and for this the State spends considerable sums of money. However, to say that the “intimate”, as it is popularly known, is a consumable subsidized by the State, that only partially solves a basic hygienic need which believes in neither productive delays nor obsolete machinery. That is why JR returns to one of the issues that the national press has insistently addressed in recent years, and in which again and again the same complaints are repeated by the population involved. “Now they are giving me the pads from September, according to the pharmacists, because they have reached the eighth cycle and these will be the last ones to be given this year,” says Odalis González, 25 years old. Odalis, like many other Cuban women, has seen the need to buy sanitary pads on the black market, or “under the table”, as Marta Valdés, 34, says, claiming that the resellers always have the item and decide its price according to demand. “Ten pesos in normal times, and in times of shortage at 15 to 20 pesos in national currency,” she says. Even with this alteration, the Mariposa pads continue to be the first option for those who cannot afford them in hard currency stores, where their price starts at 1.00 CUC. “At home it’s me and my two daughters, and the three of us have a lot of menstrual flow, so we need three to four packages per month in addition to those assigned to us. 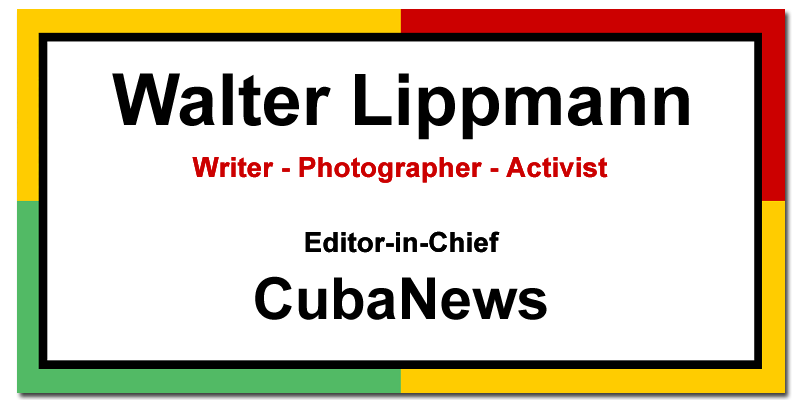 We buy them near the pharmacy from a man who always sells them for ten pesos, because my salary is not enough to pay for them in hard currency,” says Yuniet Medina, from Centro Habana. Danay Zaldívar, from Cerro, also prefers to buy them in this “cheaper” way, and she always have some in stock, she points out, because whoever sells them to her has them “even if the factory stops [producing them for] three months”. María Luisa Ortega, from the same municipality, does not [always] get the ten pads that the package should contain, let alone that it is too small a number. “Sometimes they contain eight or nine pads, I have also found some with 11; but I do not think that this is a big problem, because in neither case are they enough, not even for women who, like me, have a regular three-day-long flow,” she remarks. The said picture is also complicated from the popular viewpoint. Beyond nuances and stories, the black market should not be the solution to acquire this highly sought-after product. The perspective of the specialists regarding menarche [fertility cycle?] and the frequency with which the pads have to be changed, justifies Cuban women’s concern when they reach a stage that by itself is complicated enough. So says Dr. Arelis León Rodríguez, a specialist with the Amércia Arias Teaching Gyneco-Obstetric Hospital who recommends a change every four hours, that is, six pads per day during an ordinary period. «When blood comes into contact with oxygen it begins to give off a bad smell. Also, if you use a pad for longer than you should, you would be at risk of catching germs and bacteria, since blood is also an excellent culture medium,” she explains. Menarche can start from ten years of age and it tends to disappear before 55. That is why this is the stage in which the regulated pads are distributed; however, it is a biological process that manifests itself in different ways in each person, so the flows are not equally regular or abundant. Then, doing some calculations reveals that 18 units are needed for a three-day-long period, and 42 for a week-long one. Definitely, the fertile stage becomes a real tragedy for women, who are forced to break the sanitary rules suggested by the specialists to make our stock of pads last a few more days. «Terrible. I have to buy them in hard currency stores for my 15-year-old daughter because the ones they sell in the pharmacy make her skin sore and absorb very little, so she often gets stained. It is a sacrifice to buy them at 1.00 CUC or more because my salary is 350 pesos in national currency, and that is to cover all household expenses,” says Maribel Fuentes, from Old Havana. The lack or excess of glue in the body of the pad is another recurring complaint. “When they have it, the glue is not where it should be, and that makes the pad very uncomfortable to wear because it runs constantly and that can be an embarrassment in front of other people,” warns Yenisey Yera, from Bauta. Since 2007, extra-thin PADS cushions with and without wings [see translator’s note at bottom] have been marketed, but the change has not been welcomed by all women. Amarilis Verdecia, from San Miguel del Padrón, feel that, although sometimes it has been explained that these pads have greater absorption than the previous ones, it is not like that, and that to be safe, she must use more than one at the same time. Yadira Ariosa, from Cerro, agrees with the poor quality of the product in general, but believes that the extra-thin pads are more comfortable than the thicker ones. On December 15, 2017 Emma Hernández Ibarra, general director of Mathisa, the National Hygienic-Sanitary Materials Company –and the only producer of sanitary pads in the country– replied through Granma newspaper to a complaint issued by Yudania Roche Sánchez, who decried their poor quality. In the publication, director Hernández Ibarra explains that Mathisa relies in technology from the year 2004 that allows producing pads with and without wings, the latter mainly destined to hard currency stores. She also said that the decision to produce “wingless pads for pharmacies responds to technological difficulties in the production lines”. In search of more answers, JR spoke with Emma Hernández Ibarra and other Mathisa executives. As explained in the aforementioned publication, the super fine Mariposa pad is intended to offer greater comfort, since it is thinner and has a more compact super absorbent core in charge of gelatinizing the menstrual fluid. 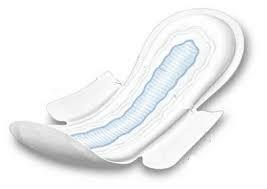 She also clarifies that these pads are designed for a normal flow and a time of use of around three hours. “Production depends on our current capacity, that is, a rate of 300 units per minute with a manual packaging system, which allows us to produce 3.6 to 3.8 million packages per month and no more” , she says. These figures match the Cuban fertile population, so it is only possible to guarantee one package for each woman. According to Hernández Ibarra, in 2017 the production of pads in the three factories of the country -one in the capital, which supplies the western region; one in Sancti Spíritus, in charge of the central provinces, and another in Bayamo, to supply eastern Cuba- was affected by the lack of essential raw materials. “Eight of the ten raw materials needed to make them are imported from countries such as Spain, Italy and China, and only the packing and packaging material is found in the domestic market,” she says. In response to this limitation, the National Hygienic-Sanitary Materials Company will begin a new “cycle” in 2018, which means that the women censored as of this month will get the pads for this year, but not those that remained pending in 2017, explained the Director General of Mathisa. Yaimara Díaz Placeres, director of the UEB Almohadillas Mariposa Habana, explained that, in addition to the long-used machinery, the fluctuation of personnel also interferes with the quality of the process, since the quality control and package inspection activities are done manually, therefore, due to human errors, generally of personnel with little experience, defective packages are marketed. In addition to Mariposa, Mathisa deputy director Mireyda Feris Tamayo explained, the company produces a discreet amount of the Petalos brand; the rest of the pads sold in Cuba are imported. The concerns that women raise regarding the sanitary pads seem to accumulate, and for them there are still no definitive solutions, at least in the coming months, during which it only remains to expect that there will be no problems in the production or transportation of the Mariposa packages, and therefore, that at least we will get the 120 units that we are supposed to receive every year. TRANSLATOR’S NOTE: Wings are adhesive and are supposed to stick to the underwear so the pad stays put. 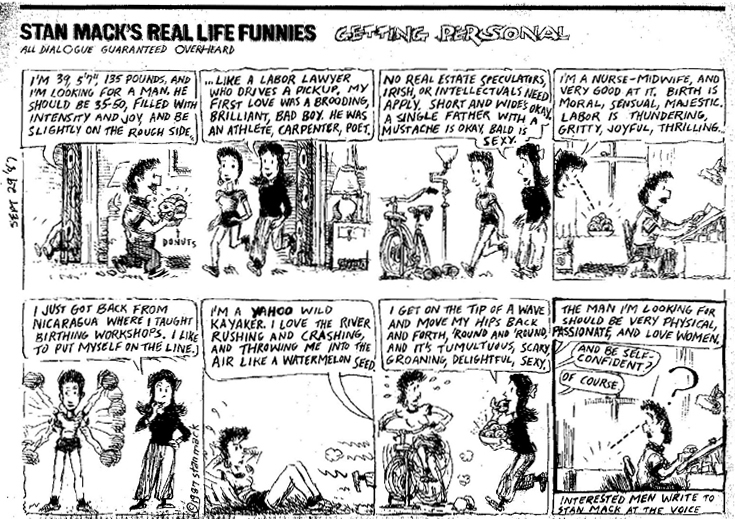 Thanks to cartoonist Stan Mack for permission to share.